What Is Farming Like Today? Do Family Farms Still Exist? Are Animals Abused On Livestock Farms? Hi there! My name is Greg, and I am the eldest of the Peterson Farm Brothers. This is an introduction to our blog and in it I will do my best to explain what the lyrics to our parody music video, “All I Do is Farm” are all about! This blog will focus mainly on family farmers like us who live in the Midwest and grow typical Midwest crops and livestock (wheat, corn, soybeans, sorghum, cattle, etc). There are countless other farmers out there who grow all sorts of different things (fruits, veggies, nuts, etc.) and raise all sorts of different animals (swine, poultry, dairy, etc. ), but since my expertise lies solely on Midwest USA farmers, that’s what I will generally be referencing. The point to take away here is that we need to appreciate all farmers, no matter what kind they are, and we should all do our best to thank those who help grow our food! I know a lot of you will disagree with at least one thing I will talk about on this blog. And that’s okay! But I beg you, please do not think that simply because you disagree with us on something, you can no longer be one of our friends! I disagree on something with pretty much everyone I know. If I didn’t talk to everyone I disagreed with, I’d be a pretty lonely person! It is important that we listen to different perspectives and keep an open mind. If you want to discuss something with us, visit our Facebook page! That I ain’t goin nowhere, farmers have got yo’ back! My brothers and I are your typical college age farm kids from Kansas who live on a 5th generation family farm in Kansas. We also just happen to have a YouTube channel! We have been doing farm music video parodies for about the last 2 years. It has been a crazy ride since our first video “I’m Farming and I Grow It” came out in June of 2012. It received 5 million views in just over a week and took our lifelong message of advocating agriculture and spread it all over the world. It was definitely a surprise to us that so many people enjoyed watching our videos. 30 million views and 5 parody videos later, we still don’t really know what we are doing but what we do know is this: We love agriculture and believe it is one of the most important things each and every human being needs to survive. And we try to show that in our videos and in our blogs as well. We also believe that farmers are some of the most misunderstood and underappreciated people in the world, and it is our goal to shed some light on why you shouldn’t take the millions of farmers raising crops and livestock in this world for granted! We hope you’ll continue reading…. All I do is farm, farm, farm no matter what! And not only do we farm, we farm no matter what! In heat, cold, sleet, rain, snow, weekends, holidays, and everything in between farmers are working hard to take care of animals, crops, and people! Thank a farmer!!! Got farming on my mind I can never get enough. So what makes one want to farm? The long hours, dirty clothes, hot sun, bitter cold, and high levels of financial risk don’t sound very desirable, do they? Farming certainly isn’t easy and it certainly isn’t always profitable. But farmers love their jobs. There aren’t many farmers who don’t love farming because if they didn’t, there wouldn’t be much incentive to farm! There is just something about putting seeds in the ground in the spring and reaping the harvest in the fall, as well as caring for animals and feeding people, that makes farming one of the most rewarding, satisfying jobs out there. Tractors make my eyes light up! 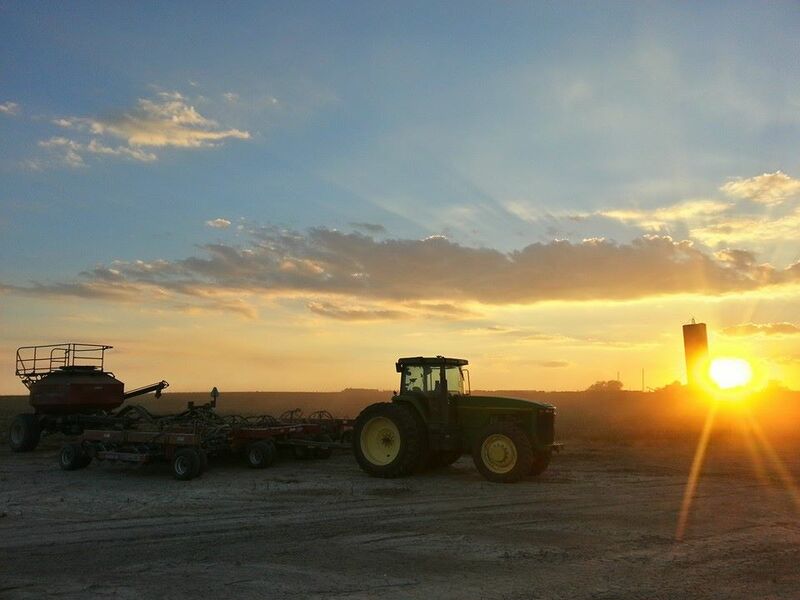 Anyone who knows a farmer knows that farmers love tractors, combines, and basically any type of farm machinery! Walking into a dealership full of new equipment makes a farmer feel like a kid in a candy store. However, new farm equipment costs hundreds of thousands of dollars, making it extremely hard for any farmer to afford. This leaves a lot of farmers with older equipment that is very susceptible to breakdowns. Breakdowns can be very frustrating (you can see us throw up our hands in the video!) and can also be very expensive. But again, once you’ve fixed a broken down piece of equipment, that feeling of accomplishment sweeps over you and you remember why you love to farm! You see, it’s not just food that farmers are raising; it’s thousands of other products that we use in every day life as well! This remarkably efficient system has developed over the last couple hundred years, and is one of the major things responsible for the advancement of our society. And farming’s not just for the old, it’s for the young and for the girls! There are kids and women helping out on farms around the world! There are thousands and thousands of women and children helping out on farms! Many farms are owned and operated by women as well. Our mom and sister both know how to drive tractors and help us out whenever we need them. Everyone knows that a farm wife is one of the most important parts of a farm and many women are actually the head operator of a farm! All 3 of us brothers have enjoyed helping out on the farm since we were 4 or 5. Our roles have gradually grown from riding in the tractor with dad, to driving the tractor ourselves, to helping make big decisions on the farm. Many family farms often have several kids helping out with the production! Family farming is truly one of the neatest parts about the agricultural community. cause all I do, all I, all I do, all I do is farm. As I mentioned previously, it can be hard to make a profit sometimes as a farmer. All the costs of farming have risen extremely in the last couple of decades, making the risk of farming extremely high. Land can cost up to $10,000/acre (or close to $1,000,000 for one large field). New tractors or combines can cost around $400,000. This means that sometimes (or a lot of times!) a farmer’s bank account will be drained or even in debt. 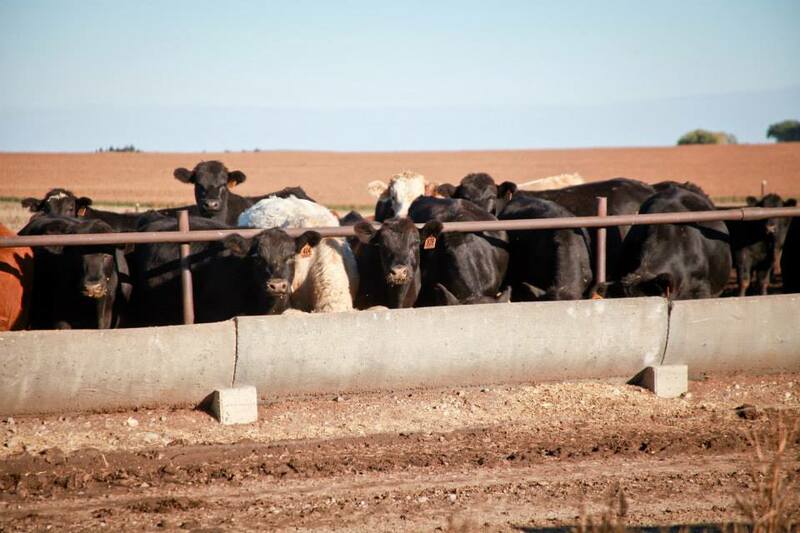 Farmers have to trust that their next crop or their next livestock sale will pay their bills. Since those are never a guarantee, it never hurts to trust in a Higher Power as well! All of these financial extremes in the farming community have led to fewer farms and bigger farmers. Farmers today on average feed hundreds of people (And this average is taking into account all of the small hobby farmers out there, an average Midwest farm is likely feeding thousands per year) and can consist of thousands of acres of land and thousands of animals as well. See farming is a family affair, you know we’re just like you! I go build my terraces up! Many people think farmers could care less about the environment. This could not be further from the truth! One of the ways farmers like us practice conservation is through no-till planting methods. No-till allows the farmer to keep residue on the soil, protecting it from water and wind erosion, and prevents catastrophes like the Dust Bowl of the 1930’s from happening. Another way farmers are helping the environment is by minimizing mono cropping. Most farmers today practice what is called crop rotation. In the old days of farming, the same crop was planted year after year, draining the soil of certain nutrients. Today, farmers plant different crops in different fields every year, which, like no-till, is much healthier for the soil. A lot of people do not realize, however, that these extremely important conservation methods of no-till and crop rotation are what are responsible for things like herbicide and pesticide usage and genetically engineered plants. You see, no-till farming is impossible without a way to kill weeds and bugs, and herbicides, pesticides, and genetically engineered seeds help solve this problem! They also allow for easier crop rotations. Contrary to popular belief, however, farmers are as conservative as possible with these tools, as they are very expensive. Modern day GPS technology (as seen in the video) allows for precise application of sprays and fertilizers and genetically engineered seeds have been adapted so that fewer applications of the sprays must be administered. Another thing to remember is that the spray you see farmers putting on their crops usually consists of over 90% water, meaning the chemical application is very minimal. Of course, we realize that the concern is that chemical residue from the spray will make your food dangerous and that genetically engineered food is somehow bad for you. We strongly believe neither of these to be true (based on thousands of peer reviewed studies) as there have never been any traces of sickness resulting from any of these farming practices. In fact, we regularly eat our crops straight from the field! To keep this paragraph short, we hope that you can see that if we can trust our crops healthiness and environmental safety enough to consume them ourselves straight from the field, you should be able to as well. To further discuss these very controversial subjects, however, we will be devoting an entire blog post to them soon. With farmland shrinking back each day, how we gonna feed ‘em, how? Keeping carbon footprint down is what we use our methods for! In the battle against hunger, what will you use for armor? The population of the world will increase to more than 9 billion by the year 2050. Farmland is being taken away all over the place by cities, highways, and houses. We WILL be able to feed this population, but only if we as the population allow farmers to continue to use the technology (as mentioned in the previous paragraph) we are using! Farmers have drastically reduced inputs over the years, and yet have continued to produce more food each year. Today’s farmers produce 262 percent more food with 2 percent fewer inputs (labor, seeds, feed, fertilizer, etc. ), compared to 1950. That’s crazy! Send a farmer thank you up! In conclusion, I would just like to ask for you to put your food security trust in the hands of farmers. There are probably bad farmers out there, farmers who abuse their land, their animals, and are not viable stewards of what has been given them (I’ve certainly never met one, and I’ve met thousands of farmers when we visit places to speak). But those farmers are few and far in between and the agricultural community will do our best to help stop those terrible practices. If you don’t remember anything else from this blog, remember this: The absolute overwhelming majority of farmers in this world are real, wholesome, good-natured farm families who are “just trying to feed enough.” And they need your support! My challenge to the reader of this blog is to get to know your local farmers! Meet an organic producer and meet a conventional producer. Meet a large farmer and then a small farmer. Talk to them about what they do and why they do it! 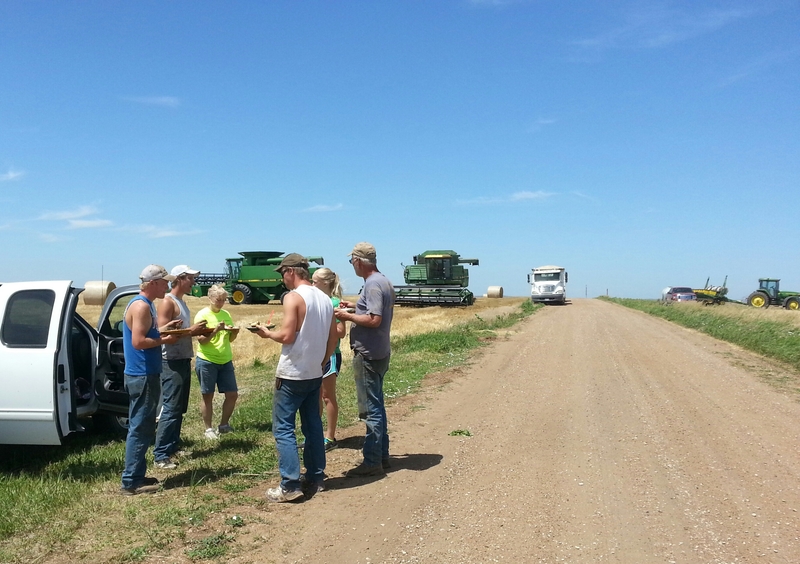 (If you want to visit our farm and talk to us, head to http://www.petersonfarmbros.com and click the farm tours tab!) I am sure you will find that 99% of farmers, whether big or small, are good people just like you and I who deserve thanks for what they are doing. I am also challenging farmers everywhere to be transparent to consumers and people who know nothing about agriculture. It’s time we show people why we do what we do. We have nothing to hide! It’s time we start working together to feed the world! Stop the fighting and start uniting! If you have any comments or questions about this blog, please head over to http://www.facebook.com/petersonfarmbros and post on our wall. We will do our best to reply to your comments in an honest, transparent way. But remember, questioning our methods is perfectly fine, as long as you are polite, respectful, and kind! Are there still family farmers? Or are most farms factory farms and industrial farms? There are over 2 million farmers in this country. Each of whom are working long hours, braving extreme weather, and tirelessly caring for land and livestock. How many of those farmers are family farmers? 96 percent of them, according to the USDA, including the farm I work on with my brothers, my parents and my sister. In fact, I’ve never actually met a farmer who isn’t a family farmer! Have you? I’m sure there are a few out there, but even then, do you really think a farm run by non-family members would operate any differently from those that are? 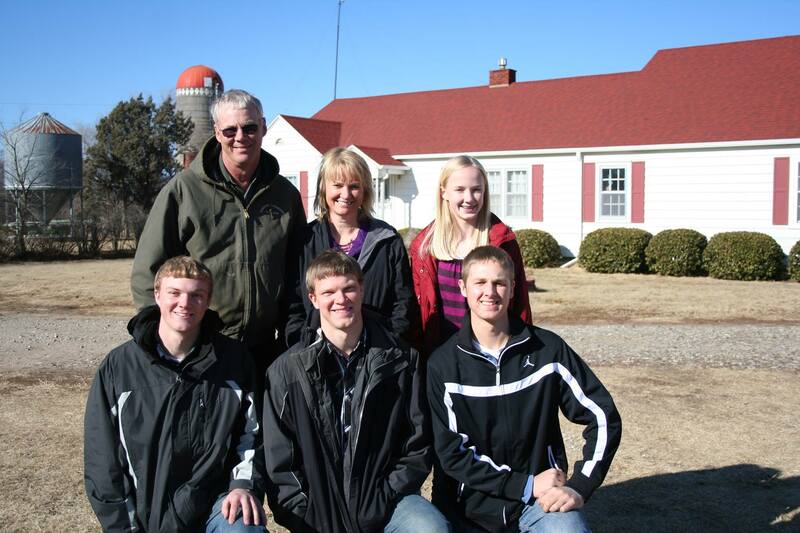 The Peterson Family on our family farm! Understand this: The vast majority of farms are operated just like the family farm that I live and work on. We have many videos about how our operation works on our YouTube Channel and we hope that this can give you an idea of what a typical family farm actually looks like! These family farms are not the family farms from fifty years ago, however. Higher land prices and higher input costs have made it extremely tough to make much of a profit as a farmer, especially on a small farm. Few farming opportunities and the draw of a higher salary in the city have also led to a decline of young people returning to their family’s farm. These factors contributed to a decline in the number of farms and the growth of the average size of a typical family farm. Many family farms joined together to farm “corporately” (Our father and grandfather farmed together as a corporation, as will the Peterson Farm Bros) to help absorb the massive costs of running a modern day farm. So, as you can see, “corporate farms” can be family farms at the same time, and corporate farming can actually encourage family farming! There are true corporate farms that operate as a large business, but they are not nearly as common as family farms. Don’t believe me? Come out here to the Midwest and try to find a corporate farmer! Eating together in the field as a family. New technology such as larger equipment, GPS, and automated processes have allowed for farmers to farm more acres and raise more livestock per farmer, which has allowed agricultural production to thrive in recent years. Many family farms have thousands of acres of land and over a thousand head of livestock, including ours. The cattle on our 1000 head “factory” farm enjoying their evening meal! An “industrial farm” or “factory farm” is considered a large-scale farming operation with over 1,000 acres of ground or over 1,000 head of livestock (otherwise known as a Concentrated Animal Feeding Operation). This definition fits our family farm and many others I know of. These bigger farms have allowed for greater food production on less land. In 1960, one farmer fed just 25 people. Today, the average family farmer feeds over 155 people and the average American spends only about 6% of their income on their food, compared to 17% in 1960. Less expensive food has allowed for 98% of the population to spend all of their time doing something else besides raising their own food. How would you like it if you spent each day of your life growing your own food, instead of working at your current job and spending loads of time and money on family, leisure, and entertainment? Fact: The “industrial, corporate, factory” farming everyone seems to be so against is actually taking place on family farms just like ours! However, please hear me out! Just because farms these days are big, do not mean they are unethical, only concerned about money, or rich and spoiled. In fact, many large family farms still have trouble making a profit. 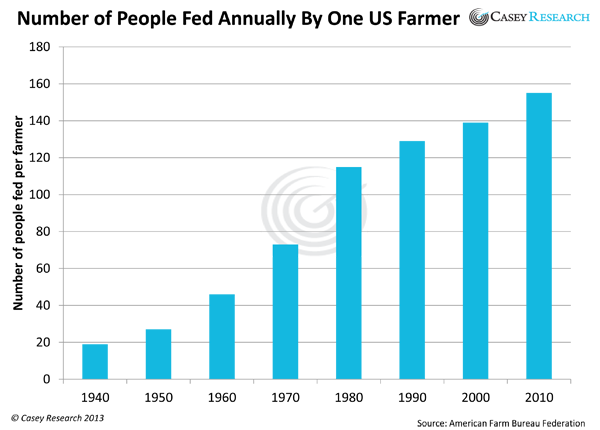 Droughts, floods, blizzards, market prices, and equipment breakdowns can wipe away all of our profit in an instant. Farmers, no matter how big or small, still have to work crazy long hours, still have to get their clothes dirty, and still have to deal with the defeat and sadness of losing a crop or losing an animal to sickness. It’s not an easy job. And that is why farmers use these methods and new technology, to make their job a little easier! I firmly believe there is no better place to raise a child than on a farm, big or small. I was outside helping my dad feed cattle before I went to preschool. I learned to drive a tractor when I was 5. I put in my first 10-hour workday when I was in fifth grade. And I loved every minute of it! The farming community that I have experienced in my travels throughout the country is one represented by strong ethical values, hard work ethic, and legendary perseverance no matter what the size, type, or location. If you’ve met a farmer that doesn’t exhibit these qualities, I would be extremely surprised! Our farm is a 5th generation farm that started out with just a few acres and just a few animals. Nearly everyone in this country was a farmer back then, and so not as much food needed to be produced. It was also a lot easier to make a profit. Today, farmers make up less than 2 percent of the population, meaning farms have had to grow to keep up with food demand. Our farm, as I mentioned is pretty big! But of course, you can see in the videos that we are as “family farm” as you can get! My dad, my brothers, and I operate our farm, with occasional help from our cousin Terry and our mom and sister. All family! And of the thousands upon thousands of Midwest farms, the majority of them look essentially like ours. So, here is the big takeaway: If you are going to hate on “big, modern day agriculture” and “large farms,” just know that the majority of the farms you are hating on are down to earth, Midwest families just like ours who are just trying to work hard to make a living!